Overall a fun trek through the Himalayas from Microgaming. 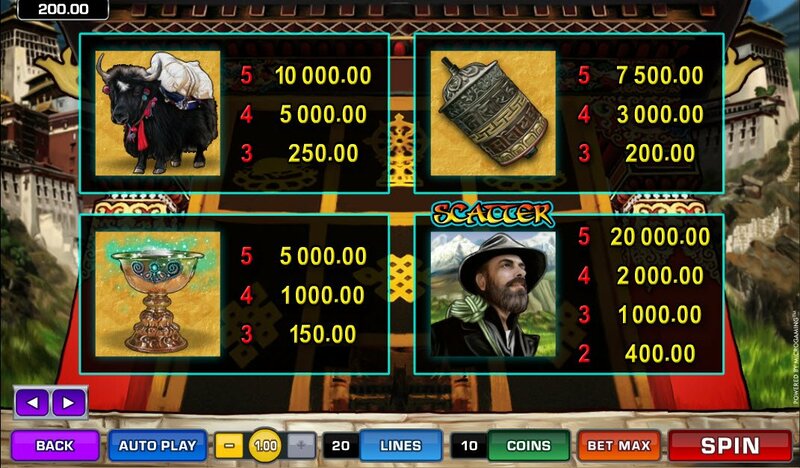 Graphics are on a par with their usual high standards of design and slot play. However, the lack of a bonus game grates and spoils the potential added fun that could have been available here. 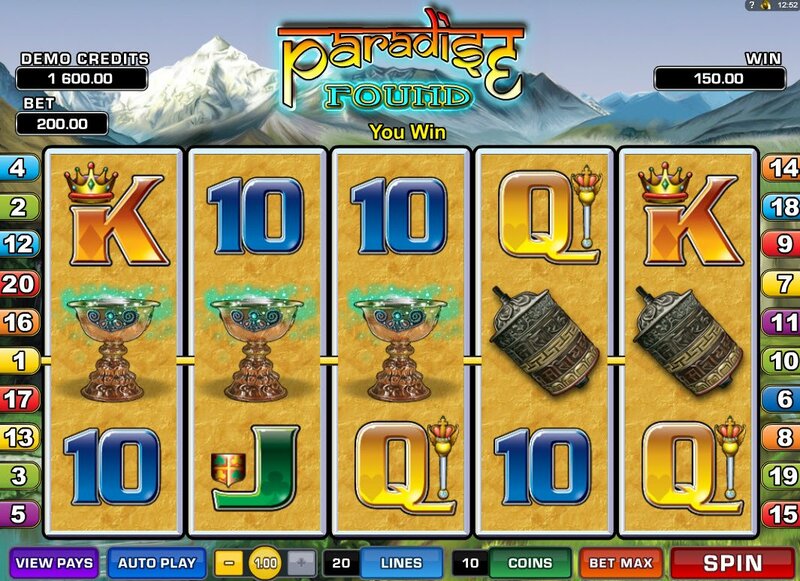 The potential winnings are large, with huge amounts available for certain characters so spin those reels and let the winnings help you find your paradise. 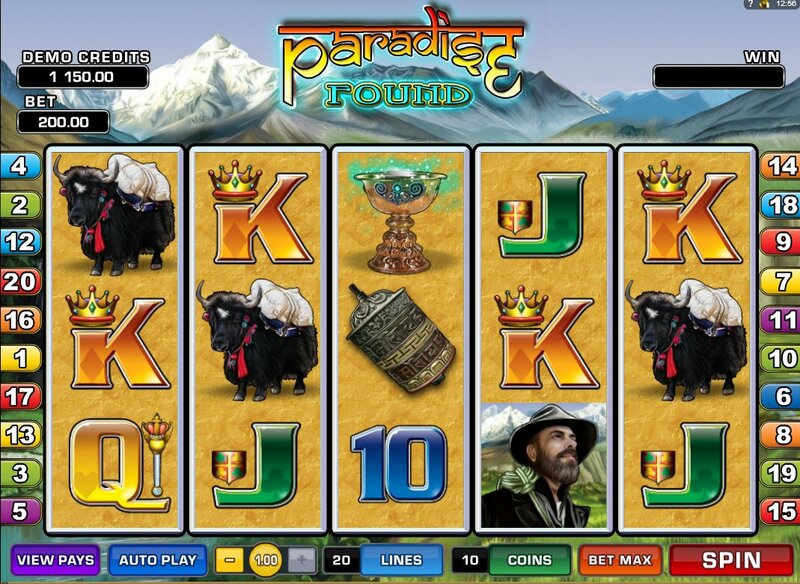 Warning, this Paradise Found slot machine review may contain glimpses into a Microgaming paradise. Now that Paradise has been found, what's it like? Well, Paradise could be a small city next to Phoenix, Arizona. However, it is a Himalayan range we find ourselves in, in fact, it's a 5-reel, 20 payline Microgaming slot machine full of mountainous fun and frolics. Bright skies look down upon the Himalayan landscape while the peak of a snow covered mountain focus your gaze on the distance, beyond the sandy backdrop of the reels. The reels themselves are large, with the graphics being designed clearly, albeit without too much help to enable us to guess what they actually are. A shiny gold trophy seems out of place in this adventures dream slot machine, perhaps it is an ode to an imaginary goblet of water, the dreams of a tired, desert trekking man, thirsty and hallucinating of a Paradise Found slot machine trophy, its golden rim full of life giving water. Man's best friend will accompany you through your journey, steadfastly carrying your supplies, sure footedly. At best guess your new friend is a Himalayan goat, complete with horns to better protect you from any stray angry Paradise Found slot bonus coins you might encounter along the way. Bright skies look down upon the Himalayan landscape while the peak of a snow covered mountain focus your gaze on the distance, beyond the sandy backdrop of the reels. It also seems you will be able to find an ancient scroll to help light your path through this Microgaming slot machine Paradise Found, worth a whopping 7,500 coins. A weathered explorer will be your scatter symbol and will help you bring home the bacon with 20,000 coins up for grabs if you spin him face to face on all 5 reels. With his hat tipped and his gaze upwards, you know the adventure is only just beginning. The Paradise Found slot wild feature is a lotus and will create sticky reels to help you reel in more prizes. It will also help substitute for other symbols to create even more winning paylines.